From the Lorentz transformation equations, Einstein derived a relativistic formula for the kinematic addition of two velocities in the same direction, which algebraically never could exceed the velocity c. Einstein claimed that this formula mathematically confirmed his second postulate concerning the constant propagation velocity of light at c in every inertial frame. Later he claimed that the 1851 Experiment of Fizeau empirically confirmed the validity of this formula. But it turns out that neither claim is correct. In Section 5 of his Special Theory, entitled “The Composition of Velocities,” Einstein claimed to have derived from his two fundamental postulates, with the help of his Lorentz transformation equations, a new addition of velocities law for the transformation if velocity components in inertial systems S and S′. 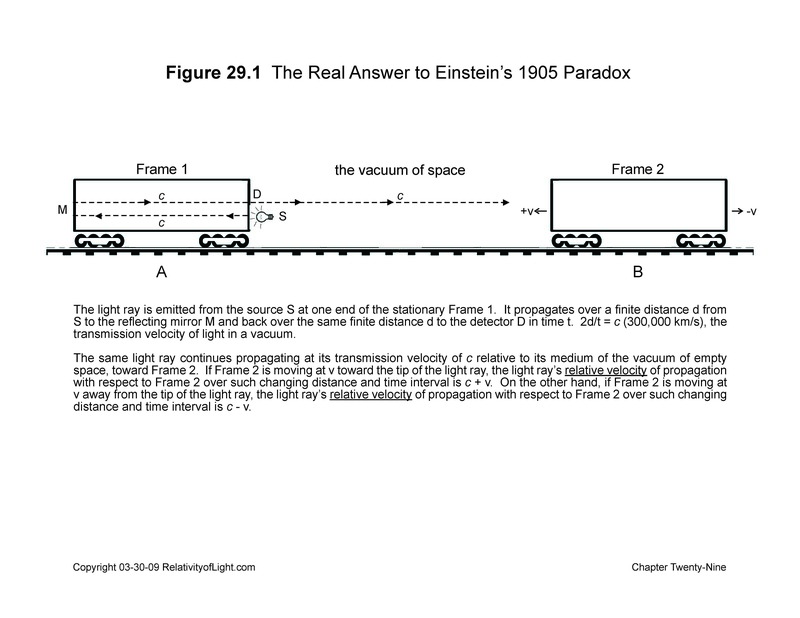 In his 1905 Special Theory, Einstein only considered the relativistic transformation of velocities parallel to the direction of relative motion v of S and S′ in the x – x′ direction (Resnick, 1968, p. 82). (Einstein, 1905d [Dover, 1952, p. 50]). In this formula, V is the “relativistic addition of velocities” for two bodies moving in the same parallel direction, as measured by S. “However, if the relative velocity v is not along the common direction of the x-axis, then Einstein’s symmetry [reciprocity] is lost” (Miller, p. 260). Based on this new relativistic transformation equation of velocities, Einstein concluded, “[F]rom a composition of two velocities which are less than c, there always results a velocity less than c” (Einstein, 1905d [Dover, 1952, p. 51]). 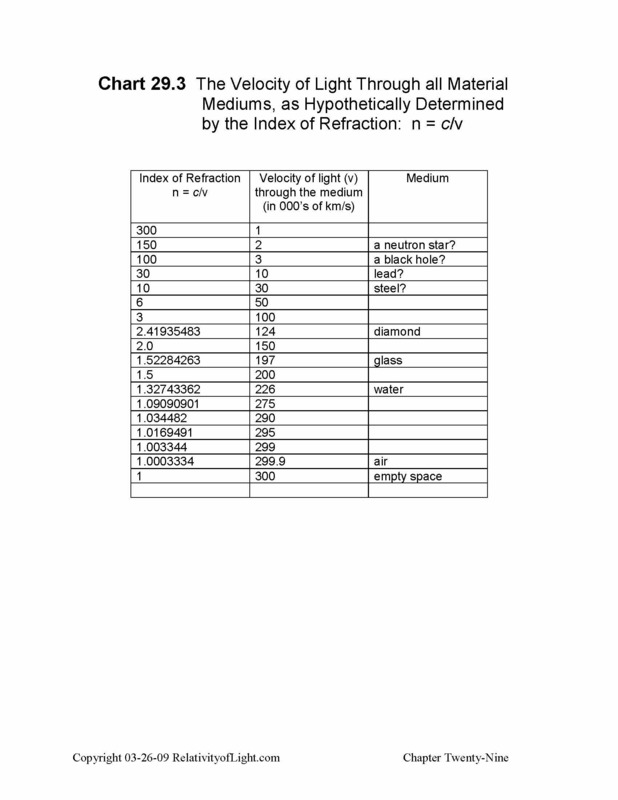 Based on this mathematical result, Einstein had previously asserted in § 4 of his Special Theory, “ [T]he velocity of light in our theory plays the part, physically, of an infinitely great velocity” (Ibid, p. 48). What was the empirical foundation for these mathematical conclusions? In 1905, there was probably only one type of experimental results that could be claimed to form an empirical basis. 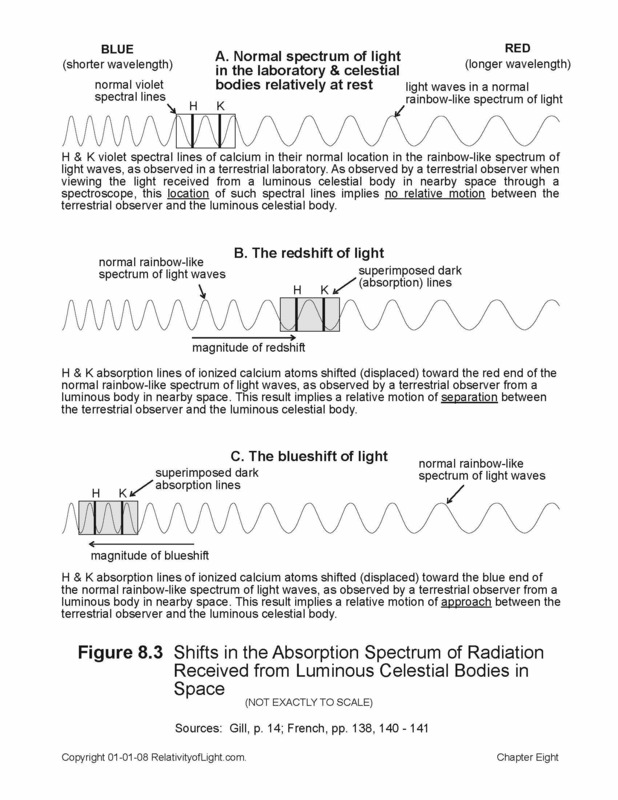 That was the highly speculative experimental and theoretical work with “electromagnetic mass” by Kaufmann, Abraham, Lorentz and others, where it mathematically appeared that c it might be the ultimate speed limit for electromagnetic mass (Chapter 18). 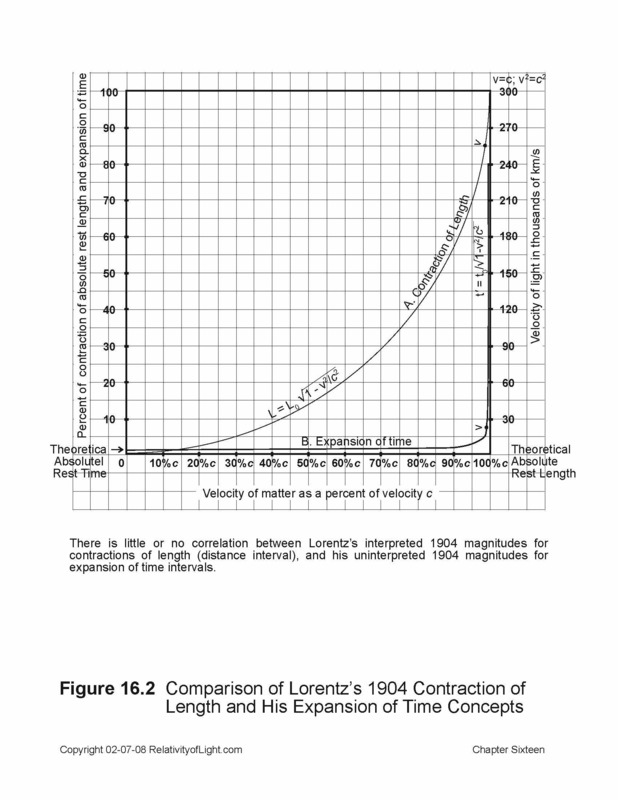 In Chapter 31, we will empirically demonstrate that the velocity of light at c may indeed be the limiting velocity for a material particle or body, but not because of the Lorentz transformation equations nor a body’s relative kinematic velocity. (Einstein, 1905d [Dover, 1952, p. 51]). Here, Einstein is also claiming that his transformation formula for the composition of velocities is mathematical confirmation for his second postulate concerning the invariant propagation velocity of light at c in all inertial frames. This result is not at all amazing. In fact, it should mathematically be expected (Miller, p. 261). As Resnick also pointed out, “We know that an assumption [postulate] used to derive the transformation formulas was exactly this result: that is, that all observers measure the same speed c for light” (Resnick, 1968, p. 80). In other words, the first part of Einstein’s second postulate mathematically results in itself, in the algebraic form of Einstein’s relativistic formula for the addition of velocities. Again, so much for the mysteries and manipulations of mathematics. 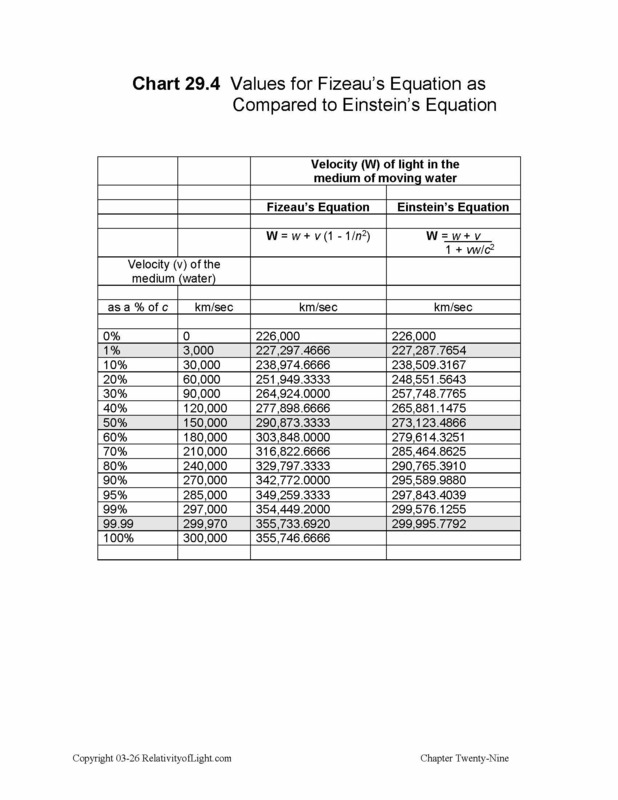 Was there any empirical foundation for Einstein’s second conclusion, “[T]he velocity of light c cannot be altered by composition with a velocity less than that of c”? In his book, Relativity, Einstein asserted that Michelson’s null results were empirical confirmation that the velocity of light at c in Michelson’s apparatus when added to the solar orbital velocity of the Earth at 30 km/s does not change the velocity of light at c in the direction of such motion. The empirical reason for such null results that Einstein described as the “right one” was the contraction of Michelson’s apparatus in the direction of such motion (Einstein, Relativity, pp. 58 – 60). Since we now know the real reasons for Michelson’s null results (Chapters 9 – 12), we should also realize that Michelson’s null results were not empirical confirmation for Einstein’s relativistic composition of velocities formula. B. Is the 1851 Experiment of Fizeau Confirmation of Einstein’s Formula? In 1907, Max von Laue deduced Fresnel’s ether drag coefficient from Einstein’s Special Theory, which he considered “as a further illustration of Einstein’s addition theorem for velocities” (Miller, p. 263; Rindler, p. 69). Based on Laue’s deduction and conclusion, Einstein devoted the entire Chapter 13 of his 1916 book Relativity to Fizeau’s 1851 “experimental verification” of Fresnel’s mathematical coefficient. The chapter was entitled, “Theorem of the Addition of the Velocities. Experiment of Fizeau” (Einstein, Relativity, pp. 43 – 46). Einstein also asserted that the comparison of his formula for the relativistic addition of velocities with the results of Fizeau’s 1851 experiment resulted in an elegant confirmation and a “crucial test in favor of the theory of relativity” (Ibid, p. 46). Many of Einstein’s followers also cite Fizeau’s 1851 experiment (and repetitions thereof) as experimental confirmation of Special Relativity, and of his relativistic formula for the composition of velocities (Resnick, 1968, p. 37; Zhang, pp. 207 – 214). Einstein began Chapter 13 of Relativity by conjecturing that, although his concepts of “length contraction” and “time dilation” only manifest themselves at velocities near the velocity of light, he would now easily derive from his “relativistic addition of velocities” a quantity which could be spectacularly demonstrated and “elegantly confirmed by experiment” at low velocities (Einstein, Relativity, p. 43; Miller, p. 263). Einstein was, of course, referring to Fizeau’s 1851 experimental confirmation of Fresnel’s ether drag coefficient. He was also referring to Pieter Zeeman’s 1914 and 1915 repetitions of the Fizeau experiment, which he claimed exactly agreed with his formula for the relativistic composition of velocities (Einstein, Relativity, p. 46; Zhang, pp. 211 – 212, 281). Let us now scrutinize Fizeau’s experiment and Einstein’s Chapter 13, to see if Einstein’s above predictions and assertions are confirmed by reality. “The tube plays the part of the railway embankment,…the liquid plays the part of the carriage,…and finally, the light plays the part of the man walking along the carriage…” (Einstein, Relativity, p. 45). See Chapter 8 and Figure 8.3 of this book for a detailed discussion and illustration of the 1851 Fizeau experiment. Einstein assumed that “light travels in a motionless liquid with a particular velocity w” (Ibid). This empirical velocity wis, of course, a known quantity, and is used to determine the Index of Refraction (Figure 7.7). The velocity of the liquid in Fizeau’s tubes (v) was also known to be approximately 7 meters/second. Einstein then asked what was the velocity W of the light in the liquid with respect to the tube T, “when the liquid…is flowing through the tube with a velocity v” (Ibid)? Fizeau empirically observed in 1851 that the velocity W was greater (by 44% of the velocity of the liquid) in the direction of the flow, and that velocity W was less (by 44% of the velocity of the liquid) against the direction of the flow (Gamow, 1961, p. 164). In order to answer his own question as to the magnitude of velocity W, Einstein deduced the “classical addition of velocities” from the Galilean transformations and obtained, W = v + w. This was the same formula that he used with his prior example of the man walking in the same direction as the carriage moving along a stationary embankment (Chapter 19). (Ibid, pp. 44 – 45, 46). Einstein then concluded that his new relativistic formula was the winner for purposes of description, and that “the agreement is, indeed, very exact” (Ibid, p. 46). Let us now continue to examine and scrutinize these and other claims by Einstein. There were three basic questions posed by the mysterious empirical results of Fizeau’s Experiment: 1) Why is only a fraction of the velocity of the moving medium (water) transferred to the velocity of light propagating through it? Unlike light in a moving medium, the propagation of sound waves is directly proportional to the velocity of a wind (Gamow, 1961, p. 162). 2) Why is such fraction related to the square of the Index of Refraction? 3) Which equation for the addition of velocities best describes the empirical results of the Fizeau experiment? There are numerous theories that attempt to answer the first two questions (For example, see Pavlovic, Sections 13, 14, 19 & 20, and the author’s suggestions in Chapter 8). Einstein had no answer for such questions. which agrees with Fizeau’s result” (Ibid, p. 46). (compare Figure 29.1 with Figure 16.2). The two formulae also hypothetically result in substantially similar quantities (compare Chart 29.2 with Chart 29.3). Third, and the most important reason why Einstein’s relativistic formula for the composition of velocities appears to be so close to Fresnel’s coefficient is the low magnitude of v (the velocity of the water in Fizeau’s experiment) in both equations. Einstein asserted that “Fizeau found, where n = c/w is the index of refraction of the liquid” (Einstein, Relativity, p. 46, F.N. 1). The approximate values in the Fizeau experiment were: w, the speed of light in the motionless water (226,000 km/s); c, the speed of light in a vacuum (300,000 km/s); v, the velocity of the water through Fizeau’s tube (7 m/s); and W, the velocity of light propagating relative to the tube (Ibid, p. 45). we get the following magnitude for W: W = 226,000.003027422169 km/s. Very close. However, when we apply the same values of the Fizeau experiment to the classical addition of velocities (W = v + w), we get the following magnitude for W: W = 226,000.007 km/s. Not so close. Thus, the answer to Einstein’s ultimate question concerning W is that his relativistic formula does better describe the result of the Fizeau experiment and the equation which Fizeau found than does the classical addition of velocities equation. From the above comparison, Einstein asserted the “conclusiveness of the [Fizeau] experiment as a crucial test in favor of the theory of relativity…” (Ibid, p. 46). But the magnitudes for Fizeau’s equation and Einstein’s formula are not exactly the same…Einstein’s magnitude for W is slightly less than Fizeau’s at the velocity of 7 meters/second for the water. At this increased velocity of the water, the magnitude of Win Fizeau’s equation is somewhat more than in Einstein’s formula. (Chart 29.3). At this greatly increased velocity of the water, the magnitude of W in Fizeau’s equation is significantly more than in Einstein’s formula. At the velocity of 1% of c for the water, Einstein’s relativistic formula produces a velocity W, which is approximately 9.7 km/s less than Fizeau’s equation. However, at the velocity of 50% of c for the water, Einstein’s relativistic formula produces a velocity W, which is approximately 17,750 km/s less than Fizeau’s equation (Chart 29.4). At the velocity of 50% of c for the water, the close correlation completely disappears. Then, at the velocity of 99% of c for the water, the difference between the two equations becomes tremendous (Chart 29.4). Thus, the apparent closeness of the result between Einstein’s formula and Fizeau’s equation only holds for velocities of the water, which are very low relative to c. Contrary to Einstein’s assertion, there is nothing conclusive about “the [Fizeau] experiment as a crucial test in favor of the theory of relativity” (Einstein, Relativity, p. 46). The 1851 Experiment of Fizeau is in no way an experimental confirmation for the validity of Special Relativity, the Lorentz transformations or Einstein’s relativistic composition of velocities (Pavlovic, Sections 13, 14, 19 & 20, with regard to similar conclusions). In fact, the Experiment of Fizeau theoretically demonstrates just the opposite. When Einstein fudged his equation for the relativistic composition of velocities so as to make such velocities agree exactly with Fizeau’s equation (Einstein, Relativity, p. 46, F.N. 1), he was in effect asserting the identity of his equation with Fizeau’s equation. But as we see on Chart 29.3 and Chart 29.4, Fizeau’s equation, when applied to very high velocities of the water, produces velocities for light in the medium of moving water well in excess of c. How can this apparent contradiction with Einstein’s relativistic formula for the addition of velocities and with Einstein’s kinematic conclusion for the limiting velocity of matter at c be reconciled or justified?